In an effort to eliminate the use of halogenated flame retardants, building code changes are being proposed by a group of fire experts, architects, chemists, and environmentalists. 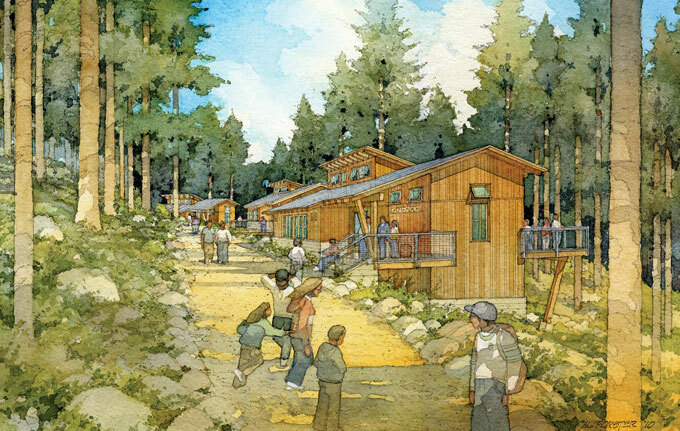 The Yosemite Environmental Education Center is being designed by Siegel & Strain Architects to avoid the use of foam insulation due to concerns about flame retardants. In 2009, when Siegel & Strain Architects began working on the design of the new Yosemite Environmental Education Center campus for the Yosemite Institute (now NatureBridge) in Yosemite National Park, principal Larry Strain, AIA, had an epiphany. Given the setting—one of America’s greatest environmental treasures—and the firm’s commitment to sustainability, it’s no surprise that the project’s objectives include net-zero-energy performance, 60% reduction of water use, and LEED Platinum certification. “In the heating-dominated climate of Yosemite, we needed pretty robust exterior rigid insulation to eliminate thermal bridging,” says Strain. Instead of using rigid foam insulation on the exterior, Siegel & Strain redesigned the envelope to use rigid mineral wool. However, achieving the necessary R-value meant a fairly thick, four-inch layer of mineral wool with furring. This increased the projected cost and complexity of the project, which initially was to be built off-site with a panelized system using steel studs. Despite the added cost, both Nature Bridge and the National Park Service have supported the design change to eliminate flame retardants. “It helps to have great clients with high standards,” Strain notes. The design has been subsequently changed from panelized construction to site-built, and the steel studs will be replaced with deeper wood studs, allowing two-inch rather than four-inch mineral wool. “This is now our office standard—wood framing with cavity insulation and dense rockwool boards over the sheathing at the walls and roof,” says Strain. The firm still uses foam when very high R-values are needed, though, and this has kept it busy on another front. At least three architects at Siegel & Strain are now actively engaged in an effort to change building codes so that toxic flame-retardant (FR) chemicals won’t be needed for all foam insulation, and to encourage manufacturers to offer foam insulation without FR treatments.